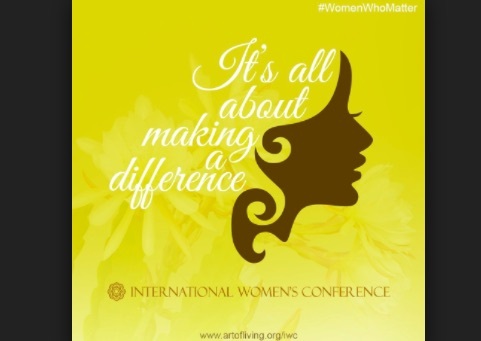 Over 500 accomplished women achievers, artists, policymakers, sportswomen among others will participate in the 8th International Women’s Conference (IWC). Titled, ‘Life: A Mystical Journey,’ the conference will be held at The Art of Living International Center, Bengaluru between February 23 and 25. IWC has unique twin goals- individual development and collective action. It facilitates partnership-building and leadership development among women leaders globally. Some of the speakers for this year’s conference include Arundhati Bhattacharya, former chairman, State Bank of India; Chetna Gala Sinha, Founder-Chairperson Mann Deshi Bank and Mann Deshi Foundation, Rani Mukherji , Indian Actress, Vandana Shiva, environmentalist, and ecologist; Madhoo Shah, actress, MridulaSinha, Governor, Goa, Adriana Marais, theoretical physicist, head of innovation at SAP Africa; Professor MaithreeWickramasinghe, founder director of Center for Gender Studies at the University of Kelaniya. “Women are leading peacemakers. They work together towards creating a stress-free, violence-free society. The conference is a message in peace and unity,” shares BhanumathiNarasimhan, Chairperson, IWC. Increasing number of women are leading from the front in multiple fields. The IWC builds on this trend. It works with women leaders to enhance their impact and gives an impetus to the global advancement of women from all backgrounds. The 2018 conference will explore ways to amplify the message of peace and empowerment, including spiritual tools. “The role of women in the development of a society is of utmost importance. It is the only criterion that determines whether a society is strong and harmonious,” says Gurudev Sri Sri Ravi Shankar, Founder, The Art of Living, which is one of the conference partners. Since its inception in 2005, the conference has focused on diversity and inclusiveness. Over 375 eminent speakers and 5500 delegates from over 100 countries have participated in the conference. The IWC focuses on advancing the status of women in fragile and post-conflict states. It also worked with the World Bank Institute to develop empowerment schemes for women in vulnerable nations and expanded vocational training for widows in Iraq. The IWC also supports The Art of Living’s Gift A Smile project. Over 58,000 students study in 435 free schools across 20 Indian states. Encouragingly, girl children comprise 48% while 90% are first-generation learners. Promoting girl child education is the underlined focus area for IWC. This year the focus will also be to create open defecation free districts in India. In phase 1, the organization will work towards sensitization and awareness about use of toilets and increasing health and hygiene in these areas. In Phase II, 4000 toilets will be built. IWC in the past has been associated with pivotal social initiatives like constructing homes for the under privileged, creating awareness about environment and environmental care, movement to stop violence against women, and child and women empowerment through skills training.